Held outdoors in the past, this year's event will be in the evening at the Event Center. 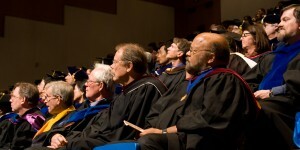 Time: Refreshments at 4 p.m., Academic Processional will line up at 4:30 p.m. in the Aerobics Room, Ceremony begins at 5 p.m.
Summary: Students, faculty and staff formally open the 2011-2012 academic year. For more on Fall Welcome Convocation and Fall Welcome Days, visit the event website.